The number of test bank items is actually compiled at the learning objective (LO) level. A topic typically has anywhere from 3-5 LOs. We have approximately 6 questions that align to multiple LOs for each topic, and approximately 3 questions per LO with one-to-one alignment, so that averages to approx 18 questions per topic. We have work currently underway that will at least double that number, and are also in the beginning stages of building in tools to expand the number almost infinitely for amenable topics. It is a priority to keep expanding the question pool, not just in numbers but also in diversity (of formats, audience-alignment, context, etc). Note that the assessment engine currently only randomizes questions for each student. 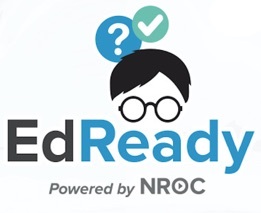 This means that a classroom full of students may see many of the same questions in the initial diagnostic, but as they continue to work with EdReady, the actual questions that are administered will become more diverse from person to person.